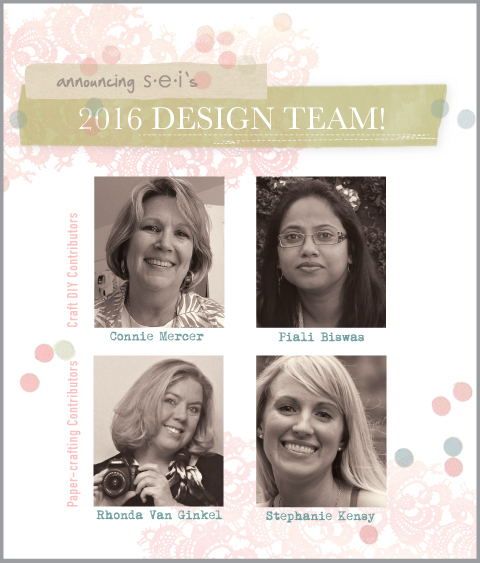 We want to take a moment to thank our 2015 Design Team! They created some really amazing projects this year and were a delight to work with. We also want to extend a thank you to the talented crafters who applied for our 2016 team. • I live on a Ranch in Texas. • I have 6 grands that inspire me to create. • I love re-purposing vintage items in my design work. • Because of #3 on the list, I love to go junkin'. • Fall is my favorite time of the year. • I live in Robbinsville, New Jersey. I’ve been married to wonderful husband for 18 years and together we’ve two adorable girls of age 14 and 10. I also have two cute puupies named KOKO & TWIX. • I've been prapercrafting and blogging since 2009. • I love all things handmade! Stamps, papers and dies are my favorite things!! • I also enjoy quilting, jewelry making , baking, cooking and driving!!! • I'm so honored to be on SEI Team. • Fortunate to live in the beautiful Twin Cities of Minnesota. • Loving wife to my husband Chuck, and a mom to my two beautiful boys, ages 8 and 6. • I began this wonderful journey of paper crafting in April of 2009. • I have always been an artistic person, drawing, painting, loving photography, sewing, writing and basically anything that is hands on. • Photographs and paper designs are often the starting inspiration for my projects. • Hi! I’m Stephanie. I live outside of Philadelphia with my wonderful husband, Jon, and our Siamese cat, George. • I'm an account executive with a PR/marketing firm. Previously I've been a writer and editor for health, parenting, fashion, and home and garden publications. • I love to make all types of paper crafts—cards, mini albums, party invitations, home décor, you name it! I tend to create projects in a clean and simple style. • When I’m not crafting, I enjoy doing yoga, biking, and spending time with family and friends. • About 10 years ago, I was invited to a Stampin’ Up! class. I took that first stamp to ink… and I’ve been hooked on paper crafting ever since. We are so excited to have these talented ladies joining us next month! yay ladies!!!! big shout out to Piali and Connie!